How to use MailChimp’s New landing page feature to build campaigns. I’ve always had a touch and go relationship with our email list. Right out the gate I added every business card I received to my list, but soon the email frequency dwindled and ultimately died when I found that I didn’t have enough content to share! Soon a year passed, then I jumped back into sending emails followed by another 2 year hiatus. Each time I started sending emails, I received positive feedback from my list, increased traffic, and most importantly, new sales. the downfall was that I also alienated individuals because they simply forgot who I was. Learning from my years of wasted opportunity using my email list, I’ve learned some very valuable lessons that can help you kick start your email marketing most effectively. Below I’ve outline the 4 steps to email marketing: Building your list, Writing your email, Optimizing your subject line, and Mistakes to avoid. You’ll notice as you read through that subject lines and consistency do appear most frequently in these steps. Being consistent is half the battle and once you have an email marketing program in place, optimizing your subject line can have the biggest effect on the open rate and sales from your emails. While everyone is focusing on building a strong social media presence, others tend to forget about the importance of email. Your email list plays a big role in your marketing campaign. It can help you build relationships with your target audience, generate buzz about your business and attract new customers. That said, it makes sense to continuously grow your email contacts. Interested to grow your email list and grow your subscribers? Then you came to the right place. In this blog post, we’ll be sharing with you some effective strategies on how to get more email subscribers. Follow the tips below to get your first 1,000 subscribers. Most website owners think that people would first access the home page before navigating through the site. But that’s not always the case. They may check your products, scroll through the “about us” section or any other page on your site. You can use your website to generate more contacts by adding a subscription form where your visitors can sign up. Be sure to place the form at the top of the page to make it easier for people sign up. Survey revealed that sites that place sign up boxes as part of their top banner perform better as compared to those located at the footer area. In order to get people to subscribe to your newsletters, make sure your sign up box is a prominent feature of your website. The more visible it is, the more subscribers you’ll get. As a marketer, you need to answer the question most people ask: Why would I subscribe to your email list if I can just follow you on Facebook? To urge people to subscribe to your newsletters, let them know that you offer subscriber-only content. Also, don’t forget to mention how often they’ll be receiving emails. Setting expectations upfront helps reduce unsubscribe rates. Tip: I’ve decided upon ConvertKit as my go-to list building tool. It is a very straightforward interface to create forms, landing pages, incentive downloads, and corresponding sequences. Additionally, there is quite robust tracking, a definite plus! You can learn more about ConvertKit Here (*affiliate link). You won’t have a hard time getting people to sign up for email updates if you have great content on your site. As a marketer, it is your responsibility to constantly supply your readers with fresh, relevant and informative content. The best marketers for your products or services are the people who are already using them. For subscribers who have been on your list for a very long time, a discount or a small incentive would get them talking. Encourage them to share your list with their family and friends. In Practice: Don’t just assume that you can’t reuse your blogs, correspondence with clients, or recent presentations. ALL of these have the potential to make in-depth content that can then be shared as resources, email campaigns, social media posts, videos, etc. Check out this guide on Repurposing Content as it can save you time and energy as you increase your online exposure. Another way to build your list is by using social networking sites like Facebook and Twitter. Due to the viral nature of Facebook, it pays to add a subscription form on your page. Be sure to include a sign up link to your email list on the “About” section of your page. For an added boost, you can also add it on your personal account and tell your family and friends about it. People love receiving free stuff. If you can give them something like a free trial of one of your products, a free ebook with useful information or access to an exclusive video, you’ll make an impact to your target audience. When done correctly, it can help you build a relationship with your audience and grow your email list. Your offer should be interesting enough to your ideal customers. Find out more about your target audience and know what’s keeping them up until 3:00 am. In Practice: My main incentive offer is our Free Resource library. You can get to this a few ways – either the link in our navigation or from the home page. Making this very obvious for site visitors increases the number of new email subscribers you can receive from your website. Social media contests are one of the most effective ways to get email addresses from folks who want to hear from you. You are free to hold whatever contest and on any social media channel you want. But since majority of the adult population has a Facebook account, you might want to start there. Also, ask people to enter their email address in order to participate. You’ve spent a significant amount of time writing an email that people will hopefully open and read. You’ve racked your brains for the best subject line. You’ve polished each sentence. Now, you’re finally ready to hit “send”. For some reason, you aren’t effectively grabbing the attention of your audience. You’re not getting a response from them either. This blog post looks at strategies to help you craft an effective email marketing copy that converts. Follow these tips to ensure that your email is effective, clear and successful. Most professionals receive 50 to 200 emails a day. With that volume of email, it can be easy to overlook some important messages. If you want your email to be opened and read, then write an informative subject line that will give recipients an idea about the content of the email. A clear subject line will capture the attention of the receiver and give busy professionals a concrete reason to read the message. Take a moment to write a subject line that accurately describes the content before you hit “send”. A newspaper headline has 2 functions: 1. it sums up the content of the article; 2. it captures people’s attention. Based on this headline, you can decide whether or not you want to read the article. Your email’s subject line should also do the same thing. If you have a very short message to convey and can include all the information the person need in the subject line, even better. Struggling to write a subject line? I recently wrote a post with tips to create an award winning headline here. People are more likely to read short and concise emails. Keep messages clear and brief. Use as few words as possible, but make sure that it contains all the important information. Also, focus on one particular subject per email. If you need to talk about a separate topic, then write another email. We’re all busy. And if someone opens your email, this is your chance to get the message across. Don’t ruin it with poor content. No one wants to read a long, ambiguous email. So get to the point and keep your word count low. Also, use simple English and steer clear from technical lingo. Just as you would in a letter, it is polite to add a salutation before jumping straight into the text of the email. But be sure to address the person appropriately. If you are sending an email to a prospective client, then you want to address him as Mr. Johnson. Meanwhile, if you are writing to a friend, starting the email with Dear Mr. Johnson would be too formal. In this case, “Hi Bob” is the best way to go. 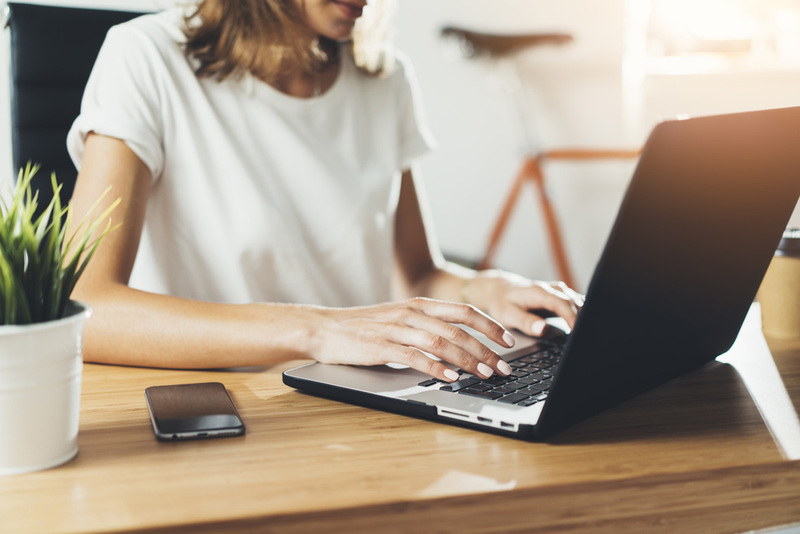 Email is usually the way professionals communicate, but that doesn’t mean that you should sound like a legal document or a spammer. The content should feel as if it came from actual human being, not a machine. While it’s good to keep the message short and brief, including a personal note can help warm up the conversation. Tip: Back to ConvertKit (or any other CRM).. make sure that you are trying to capture both the first name and email address of your subscribers. Then, whenever possible, use the NAME embed code to automatically personalize your emails. Your emails are a reflection of your attention to detail, values and professionalism. The last thing you want is to send an email that contains embarrassing spelling mistakes, horrible grammar mistakes, lack of proper greetings or one that is written in bright colors. Make sure you edit and proofread your email for grammar, spelling and punctuation mistakes before sending it. Email marketing is considered as an important part of a business’ marketing campaign. It has one of the most effective ways to engage with your prospects and customers. Plus, it provides the highest returns on investments. Open rates give you an idea as to how your campaign is doing. If the open rate for your email program is better than the average, then good for you. But if your open rates are getting worrisome, you might want to look for ways to improve it. Here are some easy ways to increase your email open rate. If there is one opportunity to convince recipients to read the email, it is the subject line. After all, it is the first thing they see on any email. Your subject line must be clear and concise. It should tell readers what to expect from the email. A good subject line is the key achieving better open and response rates. Since most people receive several emails in one day, they only need a few seconds to decide whether or not they’re interested to read the email. If your subject line is not interesting enough, people are less likely to read it. Also, make sure that your subject line is short enough that recipients will be able to read it at a glance. You’ve spent so much time collecting people’s first name and email address, now is the right time to put them to use. Personalization has been proven to drive engagement and convert more leads. It is also a good idea to send your emails from a person or an employee, rather than from the company. Studies show that subject lines that contain the first name of the subscriber boosts open rate every time. This is a subtle trust builder and an instant attention grabber. Make sure you personalize subject lines with first names. Timing is everything in marketing. If you send emails too early in the morning or too late at night, they can get lost in the shuffle of other emails. If you send it too late in the afternoon, they may decide to put off reading until the morning since they might be too busy accomplishing some tasks before going home. The best time to send emails is during lunch or after work, when you know they’re reading. If your campaign has a B2C focus, your audience may have time to check their emails after work or during lunch break. If you are running a B2B campaign, it might be best to send emails early in the morning or in the afternoon. Your goal is to send an email exactly when the recipients are checking their inbox. In Practice: Honestly, every business and every tribe is different. You may find that your emails with promotions receive the highest open rates on Tuesday’s, but your newsletters sharing blog posts have the highest open rate on Sunday’s. One recent study stated that Friday emails had the highest open rate, but Saturday emails had the most conversions. MailChimp has another study that states Tuesday and Thursday are the best to send emails. It really just depends on your market and your promotions. Don’t be afraid to play around with different days of the week and times of day. Send too frequently and you may end up losing subscribers. Send too infrequently and you may cause your readers to stop interacting with your email. Send your emails at a consistent frequency to build your email reputation. A good rule of thumb is to send no less than 1 email a month and no more than 1 email a week unless it is for a specific promotion. Most businesses are so determined to expand their email list that they tend to ignore the open rate. It doesn’t matter if you only have a small mailing list, as long as it is filled with engaged subscribers. It’s a good idea to remove inactive subscribers periodically. Email marketing isn’t dead. In fact customer acquisition has quadrupled over the past 4 years. This goes to show how effective email marketing is for small businesses. That’s great news, provided that your emails are being read by the recipients. In order to make sure that you’re getting the most out of your marketing efforts, you have to focus on what’s killing your open rates and find a way to fix them. While some mistakes are harmless, the following mistakes could be costly. While a flood of emails may distance the customer you’re trying to attract, the same reaction can also be expected if you send emails on an inconsistent basis. Have a consistent enough cadence that your subscribers would be thrilled to receive an email from you, yet relaxed enough that they don’t wonder whether or not you’re still sleeping at night. The introduction of new products or services, promotions and events your business will be holding are some examples of email worthy announcements. If you have an important event to cover, make it a point to create a multi-email campaign around it. Tip: I always recommend clients put together a content calendar as a way to visualize their entire year. In our model, as presented in Blogging Your Business, your blog is at the center of your marketing efforts. You want to make sure your blog posts are Timely, Relevant, and Authentic. This content then can be shared across all of your other marketing efforts from social media to email marketing, and even offline presentations. Creating the content calendar keeps you aware of external events and holidays that can affect your business. Subject lines are your first impression to every email recipient. They have to be clear enough that people know why you’re sending an email, short enough that they fit the screen of tablets and smartphones and enticing enough not to give away the entire email. Also, be cautious about using words and phrases that could mark your email as SPAM. Whether you’re emailing inactive subscribers, not removing hard bounces or collecting bad data, having an unreliable email list can affect your open rates. The key to a successful email campaigns is clean data. Make sure that all customer information is valid and up to date. Hard bounces should also be removed from your database. Additionally, 43% of email recipients click the spam button based on the sender email address and name. So, it’s extremely important that the recipient knows who you are and are expecting to receive emails from you. Email marketing is overrated for businesses, right? Wrong! Years ago, digital marketers began moving away from email marketing as social media began gaining steam. We told our clients that social media was how we should connect and build a tribe and that open rates on emails were decreasing. We pulled out stats that showed how much more likely someone was to buy from a business if they were connected through social media. And yes, this is still the case that consumers are more likely to buy from a business they follow on social media, but the problem now is that businesses need to pay to have their message shown to their followers. Taking Facebook as the forefront of this movement, a business may only reach 3-5% of their Likes on any given post if they decide not to boost it. Because of this, email has risen again to the best way to monetize your digital marketing. When an individual gives you their permission to correspond via email, don’t hesitate to send them an email! They have agreed that you are providing them information they need to be more educated or better a specific aspect of their life of business. In this blog post, I’ll be taking a deep dive into MailChimp, specifically the resources available within the Free account, that you can implement immediately in your business to monetize your digital marketing efforts. The main benefit of MailChimp, especially as you are just starting to build your email list, is that the Free account offers marketing automation through workflows. MailChimp is no longer just for sending email blasts, but now you can send tailored messages to an individual that directly relate to the information requested or downloaded from your website. Automation through creating workflows is the secret sauce to saving time and energy as you monetize your marketing. Assuming you have already created your MailChimp account, you will see across the top navigation, four options: Campaigns, Templates, Lists, and Reports. Let’s take a quick look at these one by one for context before we jump into the tutorial for setting up your automation sequence. Campaigns: This is where you Draft and Published emails and workflows exist. The Campaigns tab is where you will design and send your emails. Templates: Templates are where the layouts of your emails are stored. When you create a campaign, you can save the email design as a template or use a preexisting template from MailChimp. Lists: Lists are what MailChimp calls the place where you collect your subscribers. You can have numerous lists and within each list you can create different segments to ensure the right message goes to the right person every time. Reports: After you click send on a campaign, MailChimp starts collecting stats. Here you can see open and click rates, unsubscribes, and other valuable data for your business. As mentioned above, lists are where your email subscribers are housed. You may decide to have a list for your clients and one for website leads or you may have multiple lists for conferences you attend and folks interested in very specific segments of your business. To start, we are making one list that is specifically for individuals who download a lead magnet or content upgrade from your website. Click Lists from the top navigation then Create List. From here, if you are just getting started, you will want to Create a New List. There is also the option to create Groups within an Existing List, which is how we will segment leads for specific content downloads where you will want messaging targeting their interests being sent their way. Groups allow basically create sublists with overlapping subscribers. For now, just click to Create a List. individuals are on the list). Additionally, you will see your contact information. A physical address or PO Box is required by law to meet the Anti-spam requirements of the US CAN-SPAM Act. If you work from home, I recommend as you implement email marketing into your business, setting up a PO Box. Unless your list is only made from family members, you don’t want everyone knowing where you live! Step 2: Create a signup form. Now that the list for website subscribers is completed, you can go ahead and create a Signup form to embed on your website. First we will want to customize the form fields and options. Afterwards, we can embed a form into your website. Click Select next to General Forms. On the next page, we are going to edit the fields for the contact form. Here you can add fields, or hide fields. The default is Email, First Name, Last Name. I recommend reordering the fields and removing last name. For forms like a content upgrade asking for just a bit of information is great. You don’t need to inundate the new subscriber by asking them everything about themselves! The next tab, the Design It tab, allows you to customize your colors to match your brand standards. Click through the different options here to customize each element. As you work through the Signup form settings, the customizations will automatically save to your account. Once your form is customized, it is time to customize the response emails. Now, the flow for MailChimp, and this is fairly common for all email sequences, is that once an individual fills out their information, they need to confirm their email address in order to be added to the email list or to gain access to a resource. The email confirmation and welcome email are all customizable within the General Form Settings. Let’s go step by step through these options. First, select Signup thank you page from the Forms and response emails dropdown. Here, we will customize the form someone sees directly after they enter their name and email in the form. We will want to change a few elements on this page. Conversely, you could also create a thank you page directly on your website. At this point I do NOT recommend providing the lead magnet link. Within MailChimp, you need to first have the subscriber confirm their email address and then you can continue marketing to them in the future. If they don’t confirm their email, you won’t be able to send follow up emails. On the Build It tab of the Sign Up Thank you page, use the Drag and Drop editor to add a branded image as the header of the page. Hover over the form title and click Use Image to upload and select a header image to use. I also recommend editing the text on the page to be more specific about your Lead Magnet information. At this time you can also change the colors to match your brand standards. Please note, the header image and some design elements carry throughout the entire customization process. For example, if you load the header image in the form settings rather than the thank you page, the header image should automatically load in other settings. The next element of the sign-up sequence is the Opt-in confirmation email. Select Opt-in confirmation email from the Forms and response emails dropdown. From here you will see the standard text for the opt-in email. All of these elements within the email, as well as your Subject line can and should be updated. Within the body of the email be sure to reference your Lead Magnet. To adjust the “Yes, Subscribe Me To This List button text, select “Translate It”. Click Save Translation Settings to save your new button text. The next part of the MailChimp sequence is the Confirmation Thank you page. Select this from the Forms and response emails dropdown. As the subscriber has confirmed their email address, it is now alright to share your lead magnet with them. I recommend at this point, adding the resource as a PDF onto your website. If you use WordPress, Click Media > Add new and upload the PDF. To actually design this content upgrade, you can use powerpoint, word, Canva, or really any other tool that you feel comfortable with. What you will need to do once you load the PDF to WordPress is copy the URL of the resource. Copy this URL and then Paste it back in MailChimp in the setting for “Instead of showing this thank you page, send subscribers to another URL,” then Click Save. The last step in the Mailchimp sequence is to create the Final Welcome Email. Select Final Welcome Email from the Forms and response emails dropdown. The Most Important element on this page is to select the checkbox for Send a final welcome email. Edit body of email to include the link to the Lead Magnet PDF. PHEW! That was a lot of steps! But now you are all set to embed the form on your website! Step 3: Embedding your Form on your website. Now we’ll grab the code we need to embed the form into your website. Click the link for signup forms again and this time, select Embedded forms. Here you can customize the Form which will be embedded on your website. Within the Embedded forms, you can choose from a variety of layouts. I recommend collecting BOTH the name and email address of your subscribers as personalized emails not only have a higher open rate, but also a higher conversion rate. Sure you could argue that there may be fewer signups, but I would take a more engaged audience any day. Due to this, I recommend utilizing the Classic Form rather than the Super Slim or Horizontal layouts. Here, Edit the Form Title so it clearly identifies what will be downloaded or what action will be taken once someone provides their information. 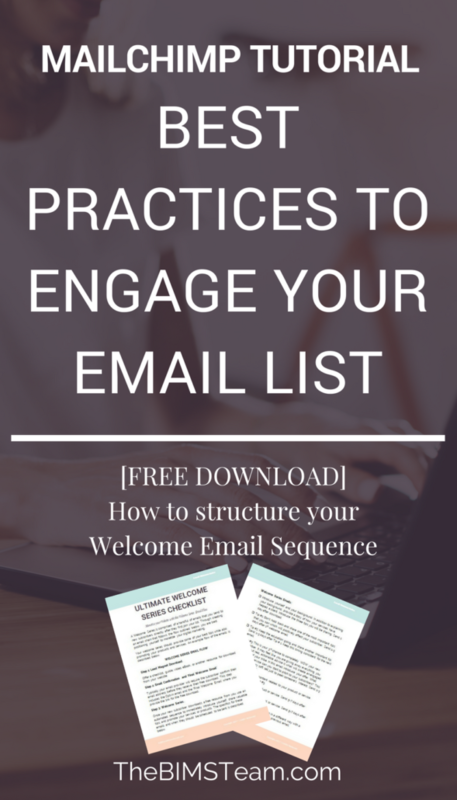 The example below has “Download your Ultimate Guide to Email Sequences” as the title. At the bottom right of the page you will see the embed code. This is the actual code that you can then copy and paste onto a page of your site! Mailchimp does have a plugin that you can use to easily embed forms using shortcodes on your site, but below I walk through embedding this form on a webpage using the full code provided. When you are editing a page on WordPress, click the “Text” view to insert html. Scroll to where in the content you would like your form to exist and paste the code that you copied from MailChimp. Once you click Publish, your page and form will be good to start collecting leads! What next, you ask? Creating the automated email chain! The automated email sequence in MailChimp or a workflow is the perfect way to introduce yourself, your brand, a course or promotion, and educate your new subscribers before you add them to your newsletter or broadcast campaign. You may be asking why you need to now add the subscriber to an automated email workflow after sending them multiple emails to confirm their email address and then send them an offer. Think about the first time you meet someone and learn from their business or the first time you sit down with a coach, counselor, or educator. You want to understand who they are and why you should trust them. Creating a relationship online should follow that same process – you need to earn the trust of your contacts. The average consumer requires 7-14 touches before they are open to making a buying decision. Social media and writing meaningful blog posts is one way to continue building a relationship with your tribe, but emails are another way. By adding someone directly to an email sequence in MailChimp, you are putting your best foot forward in the process of converting a free download into a paying customer. These initial emails should look just like the initial conversations you have with prospects. You need to introduce yourself, educate, explain your services, educate some more, and close the deal. 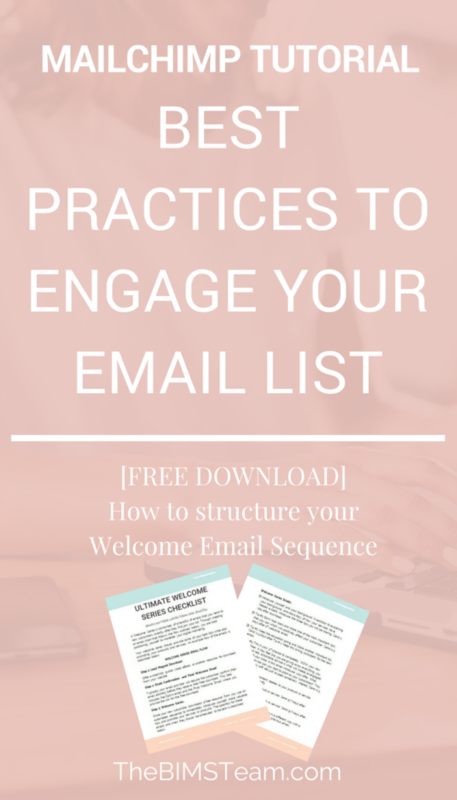 A complete guide on structuring your Welcome email sequence along with prompts to write your own emails are available for download below! Are you ready to make a lasting impression? Let’s jump in. Step 4: Creating an Automated Email Campaign. At this point we already have our List created and our opt-in and welcome email structured. Now it is time to create the MailChimp Automation Campaign. Just like other campaigns in MailChimp, automation campaigns live in the Campaigns tab of your account. In the upper navigation, click Campaigns > Create Campaign > Create an Email. From here, select Automated and in this case we will want to select the Welcome New Subscribers option. Within the Welcome new Subscribers automation within MailChimp, there are currently 3 selections: Welcome message, Onboarding services, and Educational series. Honestly, each of them works the exact same, they just are preloaded with different sample emails. In this tutorial, just select the Welcome message option, name your Campaign, and select the list you just created. As you will see in the next few steps, each of the campaigns are customizable to act however you wish and to include however many emails you want to build! I’ve found that having a blank template at times is easier to set up instead of editing the information that already exists. After you Click Begin, you can start your customization of the MailChimp Workflow. Step 5: Customize your Welcome Email within the Automation workflow. We are almost there! Kudos for following along. The first step is to click Design Email on the first email that has been already created in the flow. Once you click Design email, you can edit the name of the email, your subject, the preview text, and your from name and email. Tip: Email subjects are the key to getting folks to read your email. Don’t be afraid to jump in and test a new subject line if you think something may lead to more opens. Most important, however, is to be descriptive. People don’t like feeling as though they’ve been tricked into reading something. Questions also work well, as do tips, tutorials, personal stories, etc. Once you’ve filled out this information, click next and select your Template. MailChimp has a lot of wonderful templates that are drag and drop, or you can make your own. I recommend using a simple template for all of your email marketing. This makes the branding very straight forward and aides in brand recognition. If you already have a campaign created for a newsletter broadcast, you can jump back over to that campaign and click to save the email as a template. Because it is a simple layout, this time I selected the “Follow Up” layout. From here you can design your email! Now remember, just like when you are first meeting with someone, you want to know a bit about their background and story. This is the perfect place to add that information. MailChimp’s intuitive drag and drop email builder makes it fairly straightforward to add content and images. Step 6: Building Out Additional Emails and Workflow Settings! Once you’ve completed your first email in the MailChimp Automated campaign, I recommend adding a handful more to ensure you are providing the absolute best content right when you are starting a relationship with the new subscriber. So I’ll leave you to creating those emails. Again, you want to be as educational as possible, but to really start seeing sales quickly, there need to be some prompts to either learn more about your services or products. The complete guide to creating your emails and monetizing your site is available for download below. As for the additional settings within your workflow, we have the Trigger, Schedule, Segment, and Action. Trigger: In this case, you’ll want to adjust the trigger for your additional emails. It is okay if you would like to send an email out every day, but this may be a little overwhelming for a new subscriber. I recommend setting the Trigger to 2-3 days for your follow up messages. Schedule: This great feature allows you to specify which days of the week and time ranges you would like to send your follow up messages. Perhaps you always want to refrain from sending emails on Sundays, or between the hours of 11pm-5am, you can adjust that here. 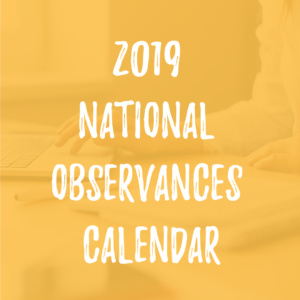 Take a look at reports from your industry about the best days and times to send emails – you may find some results surprising! Segment: If you’ve created segments within your list, here is where you can specify what segment the email should be sent to. This feature is helpful for future offers once you’ve learned more about your audience. Maybe some people are just getting started whereas others are experts in your field. It works well to send a different message to each group. Action: You can also specify something to happen after an email or email chain is sent to an individual. More advanced features here are available in the paid accounts. And with that… You know can create a list in MailChimp, structure and optimize a form, as well as the opt-in and welcome emails, embed the form on your website and create your Welcome Series automation email chain in your Free MailChimp account! In the comments section, please share your link for your forms and Lead Magnet so we can take a look! I invite you to register for my free workshop on The Secrets to Creating Content that Sticks. Email marketing can transform your marketing efforts. Think about it… A Facebook post is hardly seen by the people who Like your business, ads are expensive, and on other networks you need to be posting multiple times per day to even make a mark. Emails on the other hand, go straight to your client’s inbox and 20-40% of recipients open the email. You are able to provide more information and target specific promotions for each type of individual on your list. What tools can you use to make email marketing easier to manage? I highly recommend using ConvertKit. ConvertKit allows you to create sequences for your different email segments and has the ability to automate moving a subscriber from one list to another without you even needing to log into the account. Best of all, through their interface, you can create landing pages, forms, and customize the look and feel of your marketing collateral. Download your Free Guide to Email Marketing here. So what if you don’t have an email list yet? write posts for an audience of zero. I think you should start by writing to an audience of ten. friend who is great at web design, but doesn’t know anything about apps… And so on. to teach, you may want to re-evaluate your audience choice. Or make some new friends. To learn more about growing your email list, download your Free Guide to Email Marketing here. How has email marketing transformed your business? With the huge amount of information online and online companies popping out of the woodwork, capturing the attention of your target audience can be a challenging task. This can be daunting, especially for small business owners. But the truth is that you don’t have to spend a huge sum of money in order to get the word out about your business. Having a small marketing budget doesn’t mean you can’t generate results. Here are a few online advertising strategies that you can use, even on a shoestring budget. Figure out your target market first before you spend a dime on marketing. You are likely to waste your time and money if you start marketing before you have a clear customer profile. Ask yourself, who will be most interested in your products or services? Male or female? What is their age group? Once you have a thorough profile of your target audience, that’s the only time you can start with your marketing campaign. Email marketing can help you earn more traffic and conversions as long as you’re willing to put in the time. However, people don’t just give their email address to anyone. So you’ll have to think of some strategies in order to get people to subscribe to your newsletters. It wouldn’t cost you anything to establish your brand on most social media platforms, but don’t be fooled into thinking that social media marketing is easy. A solid content marketing is essential if you want your business to succeed. The most successful companies are the ones who post and share things that are interesting to their audience. You may not have a lot to offer in terms of discounts and giveaways to lure in new customers, but you have great contents to share. Helping people before they need your help is an excellent marketing strategy. Not only will it help you get the attention of your target audience, it can help you build a relationship with them. Make sure that you provide them with useful tips, industry news and good content that is relevant to them. Most website owners think that people would first access the home page before navigating through the site. But that’s not always the case. They may check your products, scroll through the “about us” section or any other page on your site. In order to get people to subscribe to your newsletters, make sure your sign up box is a prominent feature of your website. The more visible it is, the more subscribers you’ll get. You won’t have a hard time getting people to sign up for email updates if you have great content on your site. As a marketer, it is your responsibility to constantly supply your readers with fresh, relevant and informative content. Good subject line is the key achieving better open and response rates. Since most people receive several emails in one day, they only need a few seconds to decide whether or not they’re interested to read the email. If your subject line is not interesting enough, people are less likely to read it. Also, make sure that your subject line is short enough that recipients will be able to read it at a glance.